Small, silvery slate-coloured ones originally from the volcanic Auvergne region of central France hold their shape nicely if not overcooked. Meredith–not so keen on account of their tendency to cause flatulence; though she tells me now that reading up about the health benefits of these little jewels , she’s begun to change her mind–“I think I should be eating them….” Whoopee!! I’ll put up with any mild discomfort because the taste and texture is so pleasing. …a good source of protein and a healthy vegetarian alternative to meat. This version is straightforward with little adornment. The vinegar, salt and olive oil is enough to make me keep spooning them onto my plate. You can top them with yogurt, creme fraiche, or with smoky aubergine as I did the other night–suggested by a recipe in Ottolenghi’s brilliant vegetable cookbook, Plenty. Simply done like this, they look good on the plate next to the orange hue of a slowly sautéed fillet of salmon. 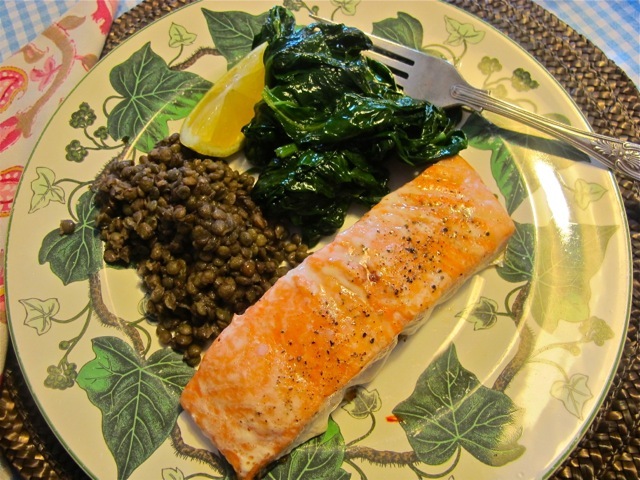 Add a spoonful of spinach and you have a beautiful dish for all seasons. Put the lentils into a pan and cover them with cold water. Add the halved onion and garlic bulb, thyme and bay leaves. Bring up to the simmer and cook, covered, until the lentils are just done–soft but with a bite. Drain them thoroughly and empty the lentils into a bowl. Pour the vinegar and oil over them and add salt. Turn the lentils over and mix gently, allowing them to retain their pleasing shape. I’ll try that, Deming–though I’m nervous of rinsing off some taste thereby. You can–excuse the pun!–they will have been seasoned, treated in some way I guess. If you can find them it’s worth trying with the real thing. Ha ha ! Just looked for the smokey aubergine recipe too …will try to get some dried lentils here in Menorca where fresh ingredients are excellent and I think I have seen them here. The waiter at the Middle Eastern Restuarant was insistent, I simply HAD to have the lentil soup. I finally agreed. It was the best soup I had ever had in my life. Now a lentil lover, I cannot wait to try this recipe! Thanks! I adore Puy lentils….thankyou for this its time to get them out again! You don’t chop the onion or garlic? I continue to enjoy your cooking lessons, and it has resulting is a significant change in my diet. I was raised in a meat-and-potatoes household, but never learned how to select or cook meat (didn’t spend much time in the kitchen), and as a young adult I turned against red meat, and have eschewed potatoes due to the carbs…your recipes have given me a new perspective that no other cookbook has! I read cookbooks like novels – more to absorb the thought behind them, rather than copy all the recipes. You and Mark Bittman are my go-to guys these days. No chopping required, their qualities just meld into the lentils effortlessly–en principe! Debra, to be mentioned in the same breath as Mark Bittman is a huge compliment–thank you. inspiring. Good tasty food does not need to be complicated or take for ever. Robin, Lentilles are in many dishes in France like ” petit salé aux lentilles”, salted pork with those lentilles, yummy!